The richness of Tommy Art DIY Paint System allows for plenty of creative options. 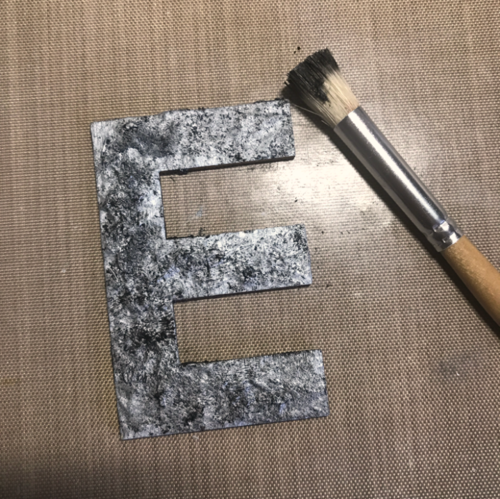 See our fun tutorial for a textured faux-hammered metal using our thick, holds-texture Silver Metallic paint. Your hammered metal will rival the real deal for easy and inexpensive accents to your home decor. This technique uses cream wax and a coarse sandpaper to allow for a distressed paint effect. Choose contrasting colors or values for best results. For the backboard you'll use Tommy Art colors Milk and Rope, along with the Neutral Wax. You'll also need coarse sandpaper, a cotton cloth and paintbrush on hand. Apply the base color (Milk) and let dry completely. Use a soft brush to apply a small amount of neutral wax to edges, corners, and other areas where a distressed look is desired. Apply the surface color (Rope) evenly and let dry completely. Sand with a coarse grit sandpaper, paying close attention to the areas where the wax has been applied. Brush off dust and protect with neutral wax applied by soft cloth. Allow wax to rest for a few minutes and buff to shine. Use the thick metallic paint by Tommy Art, a palette knife, along with antiquing wax and neutral wax to create the visible texture of hammered metal. Also keep ahold of that paintbrush and cotton cloth. Using a firm, stipple brush or a a palette knife, apply silver metallic paint to the entire surface. Apply thick and lift away from pools to create texture. When board and letters are dry, drill hole in top center of the board to serve has a nail hole. Camouflage with sprigg of faux greenery and twine. Adhere letters to board with adhesive.